©1973 Lawrence Sanders (P)2011 Audible, Inc.
Evening with an old friend! I read THE FIRST DEADLY SIN as a college student in the late 80's. Sanders hooked me with the irascible Captain Edward X. Delaney's method of catching the bad guy and his gourmet sandwiches. Having read the book I can say that Marc Vietor brings Delaney to life, giving the listener the feel of watching Delaney work, as if everything is viewed through a camera. The first several hours of this audio book contains no murder, not even a hint of what's to come. All that time is devoted to a thorough look at Daniel Blank-his life and his strange sexual perversions. This setup is important, but when murder comes, it is swift and violent. Delaney is referred to by one of his acquaintance as a "bookkeeper" which is exactly what he is. He collects data, tiny pieces, reviews it and enters the information in his journal of the crime. Adding everything up and coming up with balance. Yes, a bookkeeper. And a great sandwich maker. I was glued to this book for all 27 hours -- and the funny thing is, having read the book at least three times since it came out in 1973, I knew exactly what was going to happen. Clearly, it wasn't the element of suspense that got me -- even though there was still plenty of that. In a book this long, lots of things happen that I'd forgotten, or glossed over, before. Then too, listening to a book as compared to reading it, there are always things that seem new, that I hadn't considered before. But the big delight in listening, again, was just watching it all unfold -- seeing Edward X. Delaney plot, plan and scheme to take down the evil Daniel Blank for whom, ultimately, it's hard not to feel some level of compassion. The staid but quirky Delaney is on a par with the world's most memorable detectives -- Holmes, Piorot, Whimsey, and even Columbo, of whom he reminds me in some vague fashion (probably his absolute doggedness, in refusing to ever consider giving up or even backing down.) Bottom line, I loved this book -- absolutely loved it. Now I'm looking forward to all the rest of the "sins", wishing, for the first time in my life, that there were more than seven. I love this book and plan on purchasing the rest of the series. The writer and narrator are both excellent - a really great match. I am sorry that I didn't discover Lawrence Sanders sooner. But even if a book is wonderful, it is difficult to stay focused and listen unless the narrator is effective. There have been many times in the past that I stopped listening to a book because the narrator's delivery was distracting. However, Marc Vietor is SERIOUSLY good. I will start watching for his name as narrator, as who the narrator is has a big impact on the audio books that I purchase. The first thing that I used to do is sort by new books that were narrated by Scott Brick. Now I will add Marc Vietor to that short list and search for books that he narrated as well. If any of you authors are reading this, you should take a listen and see how talented this new (to me) narrator is. I first read this book over 20 years ago as a very young adult and was instantly hooked. I've looked for the Edward X. Delaney series every so often here on Audible and other audiobook stores with no luck. I was thrilled to finally see them here and I was not disappointed with the audio version of the book. Narrator was very good, brought the Captain to life. I can't wait to listen to the other books in the series. I read this when it first came out and enjoyed it. Thirty years later I listened to it and enjoyed it just as much. Not high action, just a good detective novel with characters you can't help but care about. It does seem a little slow at places in the beginning when details bog it down but everything builds up to a great finish. Although this book was orginially written 1973, it's relevance persists. The winding mystery can be compared to a beautiful winding road with many forks, not knowing which way it will proceed and when. It is fascinating to see how the story unfolds, how little evidence evolves in surmounting evidence and the ultimate conclusion. It is gripping and most definitely worth the time it took to enjoy it. 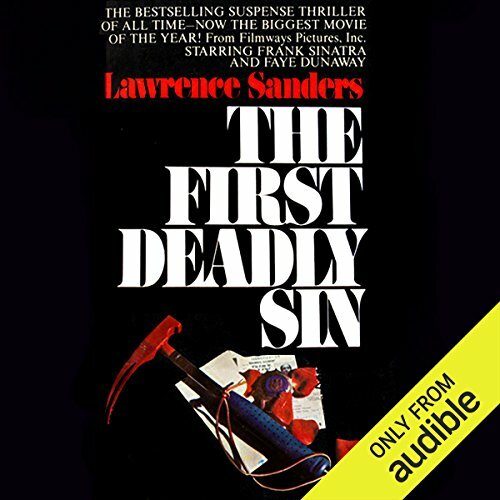 Of the more than 200 titles I've listened to through Audible, mostly in the mystery/thriller genre, The First Deadly Sin has made my Top Ten List. It doesn't matter that it was set in the 1970s. The plot, character development and flow of the story made me forget this was a 25-hour book. I could have listened for another 25 hours. If I had one criticism it was that the conclusion was somewhat anticlimactic. But this criticism is a minor one. It wouldn't surprise me to learn that Jeffery Deaver based several of his "evil characters" in the Lincoln Rhyme series with Sanders' mountain-climbing Daniel Blank. If you're tempted, as I was, to watch the movie of the same name (Sinatra's last starring role as Delaney), forget it. The movie is horrible and probably the worst adaptation of any book in the history of the world. I'm now almost finished with The Second Deadly Sin and will likely continue with the series. 50 sur 56 personne(s) ont trouvé cet avis utile. My taste in books usually leans toward current events, but I am very glad I took the chance. It wasn't out dated. This story was good in any generation. This book is set in the early Seventies when the book was actually written & It was recently made into an audio book. I have to give this book a 5 star rating without question. If I read this in the eighties - I probably would have been even more shocked then I was. This was a lot more story then it was a "Who done it"............... I enjoyed the entire ride. The narrating was great. The characters were interesting & I thought Marc Vietor voice and style made you feel like you were part of the scene. The story was realistic. The forensics of the Seventies & Dectection process was a lot more entriguing then a CSI type story. It was pretty twisted. A little sick. I loved it =0) I am pretty sure I will get The Second Deadly Sin in the near future. If you like crime and mystery - get this one! What did you love best about The First Deadly Sin? Well written, vivid quirky characters, terrific use of language. I couldn't wait to hear more. The writing was great, but I swear I could see the characters through his voice. Outstanding. No - I really enjoyed savoring it. I listen to many, many audiobooks - this was one of the best. Haunting. If you've always loved the Sins, this is better. First you need to realize that this novel was written in 1973 and may seem out of date. This book was my first introduction to Sanders when I read it in my late teens. I loved the Captain Edward X Delaney character and have waited for the Sins to come out in audiobook form forever. If you loved the novels back then, you'll love the audio version even more. The pace of the book is slow and the suspense is not going to kill you. You know from the beginning who the killer is. So why is this a good read? The characters are three-demensional, the setting plops you right down in the middle of New York and doesn't let you budge, and you have the first person view from not one, but two characters. Sanders spends a lot of time on each one for long periods of time, he doesn't switch back and forth much. If you love Dave Robicheaux (and I do), you'll love Delaney and want to read more and more. My taste in fiction runs the gamut: I love the Robicheaux novels and have read every one. I've read everything Stephen King has ever written. I love the novels Geek Love and Perfume, both Anne Rice and Ayn Rand, and the audiobook Middlesex is one of my top audiobooks (along w/ The Green Mile, Lonesome Dove, and The Life Of Pi). If you liked Sins and Delaney back in the day, you will not regret the audio. Bei der Suche nach neuem Krimifutter stieß ich zufällig auf Sanders - und bin fasziniert. Hier hat man es nicht mit oberflächlicher Action, sondern bis ins kleinste Details ausgefeilten Charakteren zu tun. Die Welt teils sich nicht in Gut und Böse - bei Sanders werden fließende Grenzen gezeichnet, und erst allmählich muss man erkennen, dass der zunächst sympathische Mörder eine ganz schwarze Seele hat. Und Delaney ist eine Figur, die mit den großen Ermittlern der Kriminalliteratur nicht nur mithalten kann. Er hat eine Menge zu bieten, an Gespür, an Emotion, an Hartnäckigkeit. Ich jedenfalls werde auch dranbleiben und mir die nächsten Bände downloaden! Erstaunlich gut und das 1973! wirkt total aktuell auch ohne heutige CSI-Technik. Der Sprecher klar und deutlich.